Ocean View Police Cpl. 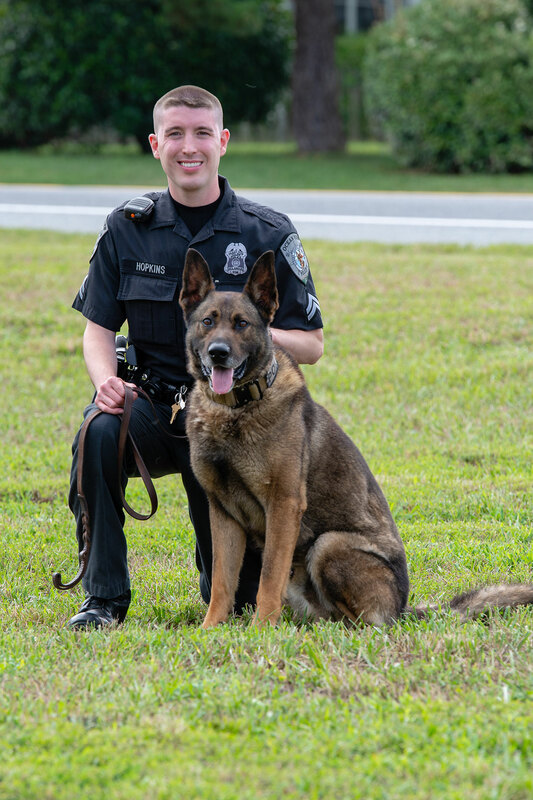 Justin Hopkins and K-9 Hardy will both attend Ales for Tails — a fundraiser aiming to provide K-9 officers throughout the state with life-saving first aid training for their four-legged partners. The Ocean View Police Department is teaming up with law-enforcement agencies throughout the state to help train K-9 handlers in first aid for their four-legged partners. With that in mind, the OVPD teamed up with the Delaware State Police and Fraternal Order of Police Lodge 16 in order to raise funds to train 50 K-9 officers throughout the state in canine first aid. Ales for Tails will be held on Saturday, Aug. 11, from 11 a.m. to 3 p.m. at 16 Mile Brewing Company in Georgetown. Tickets cost $15 for each adult or $6 for kids. Tickets may be purchased at the police department, online through Eventbrite or at the event on the day-of. The event is sponsored by the Fraternal Order of Police Lodge 16, Mountaire Farms, 16 Mile Brewing Company and Hocker’s BBQ. Those who purchase tickets will be able to enjoy live music by the First State Force, and be provided with a non-alcoholic drink and meal from Hocker’s BBQ. Alcoholic beverages will be available for purchase at the venue. The event will also feature activities for kids, and K-9 demonstrations. Monies raised will go to training 50 police K-9 officers throughout the state in life-saving first aid via Veterinary Tactical Group. Hopkins said K-9 handlers do receive minimal canine first-aid training, such as how to treat a scratched pad or cut. Hopkins said the OVPD likes to go “above and beyond,” in terms of training, and sought to educate him further. Some K-9 officers in the state were able to take the first-aid course two years ago, after the OVPD received grant funding to pay for the training for a limited number of officers. However, that funding is no longer available, so Hopkins is making a grassroots effort to raise the necessary funding. “I’ve had multiple people approach me asking when we’re doing it again,” said Hopkins. “Unfortunately, since the funding is no longer available to us, we needed to come up with a way to do this free of charge. It has to be free. Agencies throughout the state, we’re all on a budget. We don’t have $500 per officer to spend on this training plus the necessary equipment that we train with to treat our dogs. “As first-responders, all police officers are trained to provide basic lifesaving support to subjects in need until paramedics arrive on scene. This is training to help out humans,” added Delaware State Police M.Cpl. Lenny Aguilar of the K-9 unit. “There may be some time that we send [our K-9 teams] in harm’s way as part of their job to protect us and the public. There is always that possibility that a K-9 could get hurt in the performance of their duties. Aguilar said the Tactical Canine Casualty Care (TC3) course is a two-day hands-on, intensive training focusing on treatment of working-dog emergencies in the field. Both Hopkins and Aguilar said having a K-9 unit within a police department is extremely useful. “The K-9s are trained to protect their handlers, track and search for suspects that may be hiding from law enforcement, and apprehend such individuals as needed. K-9s are also used to search for explosive devices and illegal narcotics,” said Aguilar. Hopkins, who became a K-9 handler in 2014, is partnered with 5-year-old Hardy, a drug-detecting dog. Hopkins said the community will support law-enforcement agencies throughout the state and attend Saturday’s event. Host 16 Mile Brewing Company is located at 413 South Bedford Street in Georgetown. To purchase tickets, visit the Ocean View Police Department at 201 Central Avenue in Ocean View, or visit www.eventbrite.com/e/ales-for-tails-tickets-48129762415. Those who are unable to attend but would like to show their monetary support may do so via www.gofundme.com/K-9-medical-training. For more information on the event or the K-9 training, contact the Ocean View Police Department at (302) 539-1111.